Any person negating the existence of magic fairy tales in Africa will change his or her mind after having read this book. The author has chosen 40 such tales for this volume none of which have been published until now. 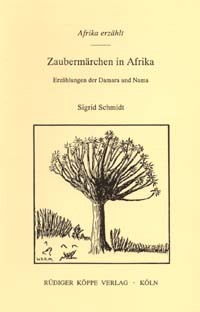 Schmidt recorded these tales in Namibia among the Nama and Damara people. They introduce us into a very special, old African magic world – a world in which charming young girls suddenly transform into huge, vicious elephants, women lay eggs out of which their babies come, and where mothers feed their children with their own liver. In this world it is a small matter to bring back to life the innocent victims of malicious creatures: one simply puts the heart of the murdered person into a calabash, and three days later the dead will be full of life again. The scope of the tales ranges from spooky to merry tales, from moralizing to grotesque ones. The second part of the book gives information on the narrators, on the circulation of the tales or certain motives in Africa. It also explains how some motives of the fairy tales are related to everyday life or popular belief. The third part examines the nature of African magic fairy tales, their so-called realism, their treatment of wonders and magic and the distinct comical element. It finally tells how one of the narrators has used her tale to express her own view of life. Ulrike Blanc in Fabula, 3/4, 36,1995, pp. 365f.